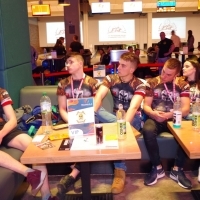 Now, less than a year after the debut at the Polish championship in 2017, he is already "recognizing" and not only among athletes and supporters of arm wrestling at the club UKS "Szesnastka", but also more widely. In particular, thanks to social networks, our website armpower.net and several interviews that appeared on Polish television. And at the armwrestling competition we saw a little fourteen-year-old boy who was walking on crutches. He pulled with passion and perseverance. He won his first medals at the Polish Championships in 2017. He represented and still represents the UKS "Szesnastka" from Koszalin. The coach in this club is the physical education teacher, captured by arm-wrestling - Jarosław Zwolak. (In addition, Jarek's passion is amateur radio and fishing.) As a coach, he was not afraid to start classes with eleven-year-old Dominik. He also noticed that for his age, weight and height - the guy has very strong hands. Why not try? Just as an additional form of rehabilitation. At first, classes were held once a week, then more often and, finally, more and more attention and strength was given to studying methods of armwrestling. Even before the Polish championship, the "Small Champion" won the armwrestling school competitions in his weight, and in the open category was the third. In Szczyrk at the Polish championship in 2017 he won two medals. Of course at the competitions there was also Dominik's dad, Damian Zaorski - an experienced participant in extreme races, marathons and mountain tracks. And the atmosphere of the event appealed to both Zaorski. The next challenge was the European Championship, which was held in Poland. There really was a serious struggle, a large number of participants. The athlete and his father did not see this before. Dominik represented Poland very courageously. There was something very important at the tournament! "Small Champion" became part of the whole of our team, one of the favorites in a white and red sports suit. To understand it, it is very important. In our sport, where all friends are, he took his place. November 2017 and the World Cup among disabled people " Zloty Tur " in Rumia. It was something! On this magical stage, with support, among very experienced rivals, among an excellent audience - Dominik again won two medals. In the armwrestling in Poland everybody knows the "Gralak" team - the father and son Stanislaw and Maciej has been known for a long time, who perform with great success. You have seen them at international events. Damian Zaorski, Dominik's dad, spends all his time with his son, and he became his sparring partner during training. After a while armwrestling began to interest the elder Zaorski. So, that Damian decided to start with Debuts (amateur competitions). This time "Small Champion" looked at his father as a fan. And Damian took the fifth place on the left hand. Start together in March 2018! Damian and Dominik will pull at the upcoming Polish championships-2018 What could we expect? In my opinion, Dominik will definitely be on the podium! I bet! He is already experienced and strong, he knows most of his opponents. If a long journey does not affect his shape - there will be medals.